This past week I was at the BuildWindows conference where the wrapper was finally taken off of Windows 8. We’ve known for some time that Windows 8 was coming but we only had a few glimpses of the real story behind Windows 8. Tuesday we finally got to see the full details about Windows 8 and how big of a release this really is (bigger than Windows 95!). The biggest news around Windows 8 was the announcement about the new touch first Metro desktop. This means Windows 8 will have count them *two* desktop modes. At first, like many, I had my concerns about it but it wasn’t until I played with both the Samsung tablet given away at Build and playing with it at home on the metal of a notebook I have that I can put into a docking station allowing me to use it with dual screens that I started to get excited. I’ll try to explain so bear with me, this is going to be a long post. If you haven’t seen the new desktop and how it works I invite you to watch this presentation by Jensen Harris that was given at Build entitled: 8 traits of great Metro style apps. There have been many articles about how the PC is dead in the news lately. These articles in my opinion are just bogus crap articles spurred on by the press to have something to write about. When the press has lulls in news they have to sit around and speculate what’s happening and thus we get articles about how the PC is dead and how we are all going to be walking around in a world with these consumption devices (tablets and phones). What they fail to think about is that *someone* (you and me) at some point has to produce information for these devices to consume. FACT: It takes longer to produce information than consume it. Thus given the old saying of “use the right tool for the right job” why would anyone think the greatest device known to man at producing, consuming and creating information, the PC, is dead? Simple, it is called money. That’s because they get paid to write these articles and speculate. So, the PC isn’t dead. This is a fact. Don’t argue against me, you’ll lose. It is going to be around for a long time. Here’s the kicker though… it is going to just look different thanks to Windows 8. As I see it, there are mainly two different modes we use information. We are either consuming information or we are producing information. It turns out the absolute best device for doing both of these is still the PC (you know that thing that isn’t dead?). If anything, the PC it is about to undergo a major revolution. And by revolution I mean the hardware is going to change as we know it today. Me personally I fully welcome this change and here’s why. The past week at the Build conference I spent the majority of my time consuming information. I did so on two devices: iPad and phone. The times I had to produce small amounts of information via tweets, text messages or quick responses to email these devices worked. Notice I used the phrase “small amount of information”. This is key because once we move past producing a small amount of information these devices fail. Have you ever received an email on either your phone or tablet where you told yourself, “I’ll answer that later”? I bet everyone has. Why? Because these devices are information consumption devices. Let’s face it, when we have to do real work these devices fail. I don’t know how fast you can type but I can pump out upwards of 140 words a minute. Now why in the world would I want to use touch type to type say 25 words a minute? My time is valuable and thus when I have to produce more information (like a blog post) that requires more typing I’m not going to do it on a consumption device (tablet, iPad, etc). The reason Windows 8 is such a game changer is it is going to allow all of us to consume information and produce information on the same device. Windows 8 is like a Transformer. It can transform to consuming information to also producing information. What does Windows 8 have that changes this? For starters it has a touch first interface. This new interface (pictured to the left) is really the the consumption interface. Microsoft calls it the Metro interface. But the standard desktop interface is there as well, what myself and others have coined as the Retro interface. Or as I like to call it, the desktop where information is produced or created. The Metro interface is immersive, full screen apps, full touch enabled, and as Microsoft calls it *fluid*. For tablet and slates this new interface is going to serve us all very well once developers start filling up the store with awesome applications. Being able to switch between these different modes is powerful. Switching between the two is easy and very smooth just by pressing the “Windows” key on the keyboard. Or the “Windows” button if you have a tablet. By having both a touch first user experience and the full desktop this allows the user to transform the operating system to meet the various requirements how the user wants to interact with information. Apple for example has a desktop OS and they have an OS that runs their iPad/iPhone. When you’ve hit the point to where you need to produce information instead of consume it one has to set their iPad down and reach for their notebook or PC. This is something I think Microsoft has gotten right by simply just using Windows 8 to do it all. Think about it for a minute. Think about how the Enterprise today provisions and manages iPads or Android tablets? They sort of don’t. By leveraging Windows, Microsoft has just put tablets and slates into the Enterprise so all of the tools of deployment, management, etc can be leveraged (bitlocker, roaming, active directory credentials, etc). Remember your tablet is just Windows! Brilliant! Folks this is a game changer, make no mistake about it. With Windows 8 the hardware revolution that is coming is going to change things as we know it today. I see a day when we won’t have a desktop at home to get multiple screens, and a notebook to carry with us, and a tablet to carry with us. I see all of these devices converging into one simple and easy to use PC, I mean tablet, I mean slate, I mean notebook. Someone will create a new name for it. Something like… SlateBook (remember you read that here first! ). We already sort of got a hint of this from Samsung with the tablet they gave attendees at Build. It came with a docking station and a keyboard. This allows everyone to interact with the machine normally on the retro desktop. But it also is a tablet that can be removed from the docking station and used as more of an information consumption device leveraging touch. The PC isn’t dead, the devices will just transform for the user as they need it to. And Windows 8 is the OS that is going to make that possible. I’ve thought about this a lot over the past week and I’ve researched a lot of devices as of the past week trying to find something I could maybe even potentially purchase to run Windows 8 that would transform if you will. I’m saddened to say that I haven’t found anything *yet*. Yes I want my cake and eat it too but I am tired of having three devices to do three different things. As I see it, Windows 8 will allow us to embrace a new hardware revolution where these devices converge into a single power device. It will in fact be a PC (personal computer) but it will be also a tablet for consumption and support full keyboard and mouse to switch between consumption to information producing. Right now my perfect device would be an ultra thin notebook like the Asus UX21 that would also have a touch screen that can be transformed into a slate / tablet. Now I’m not saying that there will not be a lot of just tablets created and sold. I am sure there will be. But from where I’m sitting I’m honestly tired of tablets, and notebooks, and really not having my full computing experience with me wherever I go. Yes I want my cake and want to eat it too. If the OEMs can get the hardware right Windows 8 I predict is going to start a new hardware revolution whereby consumers can purchase one device that does it all. Will they be cheap? Probably not but honestly who cares! Would you rather carry one device with you everywhere or three? One? Good glad we agree. Thanks for sharing an informative and educative post! Would surely try this out. I enjoyed this post of yours and I must say that everytime I come back to your blog, I always have something new and informative to read.Thanks for your update. There is no mention of x86 vs ARM architecture here and the true hardware transitions taking place. The IPad is more powerful than PC’s of 10 years ago, games which used to challenge the computers i grew up with at home (I’m 25) are jokes to its hardware. The PC is dying because the niches in which it outperforms ultra mobile devices continue to shrink and there is a sort of reversal of trends back to thin clients communicating with backends that do the heavy work i.e. cloud computing. This is just another one of those speculative articles the author was so quick to dismiss. Bottom line windows 8 is just another interface slapped on top of an updated NT kernel….the big news was the cross compile to the ARM architecture. The chip set found in the majority of smart phones now and in 0 machines configured in large plastic boxes meant to be anchored to a desk. You know, I was trying to achieve something similar to this (information consumer and *a little* information producer) by going for the Asus epad Transformer. And it has done well so far, but I was just thinking, if it actually ran windows it would take the cake. For my use I think intro of Windows 8 would be awesome, and I think your article hit the nail on the head in summarizing the advantages of Windows 8, especially for a user like me. Thanks. The first Fact left out something. For every serious producer that needs a proper PC, there are a million consumers. I have pretty much the same view point. I would also like a food replicator. Then I can undock my smartphone AND a meatball sub. That’s close but still makes me carry a keyboard around. I want a tablet / notebook combo personally. Interesting, certainly clarified win8 for me. The retro thing had me swinging towards the apple. I work in IT on windows mobile devices and I cant tell you how many times I pressed my finger against my laptop screen while switching between the device & emulator – it was as if windows was already trying to communicate with me from the future – a parody, not to be taken seriously. Will still up-skill on the other mobile platforms though as mobile platforms are split 3 ways and its impossible to write one app to for on all three platforms, they each require a rewrite. And win8 is going to take a while – as all developers know, we only use a microsoft product once they release service pack 1. I’ve been thinking along the same lines. The ideal hardware for me will be a laptop/tablet hybrid. Something like the iPad 2 with the magnetic cover, but where the slim-line magnetic cover can turn into a stand & keyboard so I can take the whole thing with me. And of course be dockable when I get home so that I can drop it into a monitor-stand/hub which has connections for a full size keyboard, mouse, and larger touch-screen monitor. Is the PC dead? Of course not, you’re totally right. But with zero analysis of any of the underlying issues this piece is just a fanboi rant. This is the least impressive, least insightful and least useful discussion of W8 I’ve read. > We are in a period where currently technology and thinking are re-imagining what devices should look like, act like, and allow. But, unfortunately, the state of economy does not allow us to buy new devices. Dream, think, imagine… and spend the money to something more practical. To power up faster – do not reboot. Hibernate or suspend. Nope it will not work. A mobile device will not be also a PC. Why? you’ve said it! exactly because of power consumption. This is exactly why the phones and slates use ARM, and less RAM and so on. They do not have the power to run full blown Windows beneath. Your dream has technical limits and won’t come true anytime soon. So you must separate the mobile part from PC part and… you are at square one again. This is a shift from the information producer to the information consumer market and tries to grab both sides with Windows 8, but it is at a cost to the information producer. The reason I argue this is bad news, is rather than focus on making a revolutionary new desktop OS, Microsoft has bailed on that and given us essentially a Windows 7 desktop with a Retro (not Metro) tablet touch mode, pretty, but essentially useless mode for information producers. As for being a consumer, if I want lightweight, I use a browser that connects to the cloud, not some half-breed, half-baked idea. Don’t get me wrong, it has some great features, but by trying to satisfy both information producers and information consumers with one OS, they have watered down delivering the best they can for both separately by having to compromise on features that wouldn’t crossover well between both modes. I would have been much happier if Microsoft focused on a database-driven registry (remember the promise of WinFS back almost 10 years ago), a full-fledged OS that boots in 10 seconds and that doesn’t constantly spend the first ten minutes accessing the hard drive after booting (it still takes over two minutes even with an SSD to boot up and get a contact from Outlook and try five minutes with a traditional hard drive, this is where the consumer devices win out and will continue to do so.) If I am an information consumer and time is critical, am I willing to go with a Microsoft Metro powered tablet and wait a minute or go with an Apple or Google powered product that can give me the contact within 3 to 4 seconds? The answer is this isn’t the answer for consumers who think instant gratification takes too long. So unfortunately Microsoft in its attempt to woo the information consumer market at the expense of the information producer risks losing both and Wall Street seems to agree with my assessment so far. Windows 8 Build showcases and both Google and Apple stock increase as a result. Seriously, this is the first post that seems to be based on the reality of how we actually work and the tools we need to get that work done. Thanks for the info. Add one more thing. From the un-docked table you can undock just one more thing: a smartphone core. THEN you have it all. I just remembered the new WiiU, which has a remote control that is basically an IPad (10″ touchscreen), but the video for the device is generated on the console and the sent wirelessly to the controller, so you can play games without having to have the TV turned on (it can also be used to display a different image than the TV if you want to play 2 players where you can display information only to 1 of the players. That will be out before Windows 8, so it might be nice to have that style of interaction supported as well (it would enable a powerful GPU on the power computer to generate impressive graphics that could be displayed without having to physically dock the detachable notebook). I’d like a notebook component with touchscreen and ARM processor, which docks with base station that has Intel processor in it. When docked it could use the ARM to run ARM native applications, but running desktop applications on the Intel processor in the base station. The system could use the ram in the notebook, for the page file. 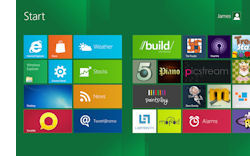 There sure is a lot to like about Windows 8, if only the OEMs would agree not to choke the system to death with bloat. I agree with this article. Microsoft is making a smart move by making a tablet/desktop OS in one. I would definitely go for this option without a doubt. I’ve just got a Gigabyte S1080 tablet that runs Windows 7. The tablet has USB 2.0 and 3.0, VGA connector, ethernet(wired – weird I know), trackpad, mouse buttons, wi-fi, bluetooth, card reader, etc, etc… You can see it here (http://www.absolutesolutions.co.za/Default.aspx?mod=Main_Article&Article_ID=c9124d75-0b53-442b-8e65-c041c0ef9ee5) I’ve been using it for about a month, and it does everything the above article describes. I bet with Windows 8 it will be even more awesome. And I don’t even need to buy a new device to have the new OS! What a save! ‘little’ tablets are for those who want little tablets. If you want a ‘big’ system, you can still run Win 8 on it, and switch between desktop or Metro. There were some announcements about security in Windows 8 (defender, etc) but I haven’t dug into them. It would seem over the last 5 years or so MS rate of development significantly increased on all fronts not just OS. Meanwhile there have been many quite bad security risks, holes and total loop holes found in Windows Vista, Windows 7, new office and more. Here we go again jumping into W8 while W7 still has unresolved points of support. My point in short means until they can find, develop and patch such issues as quick as their realising new products security is always going to be “behind the times” by the very company is developing the products. I think we are saying a lot of the same thing Eric. I’m just saying that windows 8 is going to help drive this forward. It should be fun! Not sure what you are reading into this post, but no one has to change anything. With a machine like you have you’ll just install Windows 8 and be done with it. Benchmarks that were done on Windows 8 shows it is faster than Windows 7 in almost all categories so the team appears to have done a great job at making things faster, especially boot times which are around 8 seconds compared to 37 seconds on Windows 7 with the same hardware. What I’d like to see them add is a touch mouse pad like the Apple Magic Trackpad that will allow you to use your current desktop including touch without buyin a new multimonitor setup. Just attach the trackpad wiht bluetooth and use that for swipe, and now you have the best of both worlds, future and past living together in productive harmony! in, undock, go for a coffee (and plug in). 9 – where you don’t own a PC, just an ID that you can use wherever you are? I agree with Chris, but make it so that it is truly parallel and cooperative when docked, yet function independently when apart. Make it so that all the devices, phone, pad or tablet, and PC can work together cohesively. Nice points but you, like others on the opposite end to take things to the extreme… presumably to attract traffic. I don’t take the current discussions about the end of the PC era to mean that it is dead. It has been the predominate device used to interact with technology. I do believe the “PC” is in the process of coming to and end and when we look back in time, we will indeed see that this time period marked a transition from one form factor to another. With that said, for some time to come, there will be a need for a “PC” in every space.. just used less and less frequently. We are in a period where currently technology and thinking are re-imagining what devices should look like, act like, and allow… it doesn’t take a rocket scientist to see where this is heading. I have a question, My current box has an AMD quad core processor with 4GB of DDR3, and an NVidia GeForce 465 GTX GPU. I use it to run VMVare , Flash, NetBeans when I’m working. When not, I am runing games with last gen graphics. Now my question is, dose Microsoft expect me to change that in for a crappy little tablet with not even half of the specs, or in best case scenario give a bunch of money for a tablet with similar specs if I want to run Windows 8? I do like the idea’s being brought too the table by MS, however it seems security is never going to catch up too the potential risks at this rate of development. Your ideal of powerful enough to compete with a standard desktop but with long battery life is a stumbling block I’d think. What if the docking station housed RAM, Graphics card, etc. (maybe even an additional CPU?). Then when docked you would have all of that power but when detached, for consumption, you would have a machine like an iPad (for power). The transformer is getting close but is not as robust as needed to replace a full 24/7 desktop. Eventually they’ll figure it out. Well, let’s hope they do! Asus eee Pad Transformer 2. Rumored to be coming out with windows 8 running on tegra 3 chipset sometime in Q1 or Q2 next year. Theres your cake, eat up.